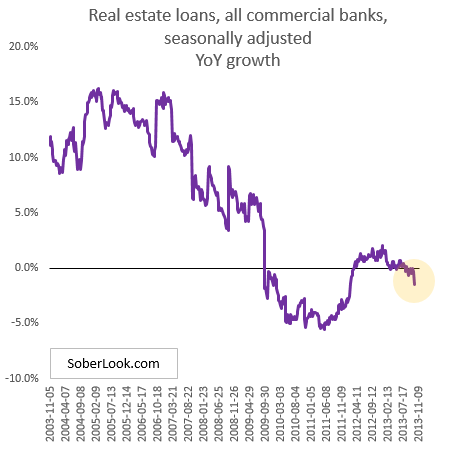 After less that two years of modest but positive growth, real estate loans in the US banking system have recently gone into the red again. Lower demand and banks' unease with real estate keep this sector from growing. On the other hand, banks are making a big push into auto loans. Auto loan portfolios are up 6.4% from a year ago as car sales remain brisk. Note that non-bank (shadow) lenders including ABS buyers (see post) are also a major part of this market (just check Carfinco's shares on the Toronto Stock Exchange for example). Crain's Cleveland Business: - Columbus-based Huntington Bank enjoyed a record quarter in originations in indirect auto lending, the industry's term for when borrowers secure financing from a lender through a dealership. The bank's originations totaled $1.2 billion in the third quarter of 2013, up 10% from the year-ago period and nearly 19% from the third quarter of 2011. Auto loan growth also has accelerated in 2013 at Firefighters Community Credit Union in Cleveland. Its auto loan balance in this year's third quarter was 13.6% higher than the year-ago quarter. That's a greatly improved performance over the 3.3% increase Firefighters recorded in the third quarter of 2012 over the like quarter in 2011, and the 7.5% decrease it saw in the third quarter of 2011 versus the third quarter of 2010. Given the relatively low default rates in auto loans, banks' credit departments have loosened lending requirements. And as the average age of light vehicles in the US continues to rise (above 11 years), auto sales pick up (with US baby boomers now dominating sales - see story). Detroit Free Press: - A boom in auto loans continues to support a resurgence in U.S. car buying that has hit its highest sales pace since 2007. The total amount of outstanding auto loans topped $782.9 billion as of Sept. 30, up $103 billion from the same period last year, according to Experian Automotive’s quarterly report. [Experian] said the availability of credit, combined with consumers’ strong track record of repaying loans, is helping banks justify greater access to loans and helping to boost U.S. automotive sales. 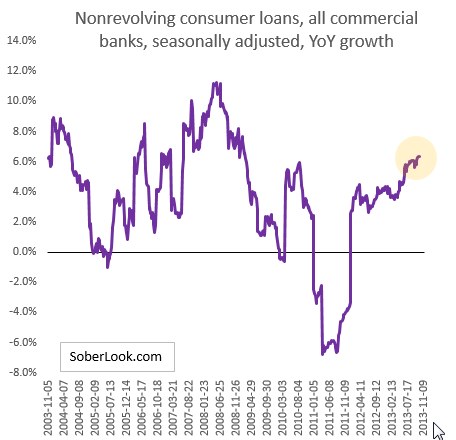 But of course as the auto loan boom replaces the real estate boom of 7 years ago, signs of excessive lending and risk taking by banks are beginning to appear. Just as real estate lending was "safe" back then, auto lending is "safe" now. Detroit Free Press: - Banks have become increasingly willing to provide loans to sub-prime customers and are allowing consumers to finance over a longer period, with some loans extending as long as eight years. Indeed, longer dated auto loans are becoming increasingly common. Montgomery Advertiser: - More new-car buyers are stretching out their loan payments for as many as seven years, and some experts worry that’s another financial time bomb. While Not so long ago, remember the days when ads touted 48-month loans. Today the biggest growth is coming in loans lasting up to 84 months — That’s longer than most people are expected to want to keep their new car. The longest-term new-car loans — 73 to 84 months — have jumped 25.1 percent in the past year and now make up 19.5 percent of total new-car lending, according to Experian Automotive. All other loan-length categories, in fact, have become less popular as buyers shift to longer terms to get lower payments. The next-shorter category — 61 to 72 months, considered a very long loan only a few years ago — now is 41.7 percent of new-car loans, Experian says. That’s down 3.2 percent from a year ago, but it’s still by far the biggest single loan-length category. One of the problems with risk management departments at banks is that they often "fight the last war". As a new asset class becomes in vogue - sometimes because of historically low default rates, banks pile into it and profits flow. With competition heating up, lending standards suffer, and risks of another systemic credit problem rise.